How Sol Development Preserve The 'The SOL of Black Folk' Members of the West Coast jazz and hip-hip group discuss SOL Development's debut album and the role music plays in community activism. The members of SOL Development (Left to right): Brittany Tanner, Felicia Gangloff-Bailey, Karega Bailey and Lauren Adams. The West Coast music scene has a new group to champion. The music of Oakland's SOL Development has been described as jazz, hip-hop, and, of course, soulful. The four-person collective's style may sound familiar but the member's backgrounds are not. They're teachers and classically trained musicians who use music in the classrooms to promote learning. Though the group is now based in the Oakland area, three of the group's members met while attending Hampton University in Virginia. After college, one member Karega Bailey spent a few years teaching in Washington, D.C., which helped inform his ideas about how to get heavy subject matter like gun violence, police brutality and institutional racism to young listeners. The members of SOL Development now run the Roses in Concrete Community School in Oakland where they frequently bring their music into classroom conversations. 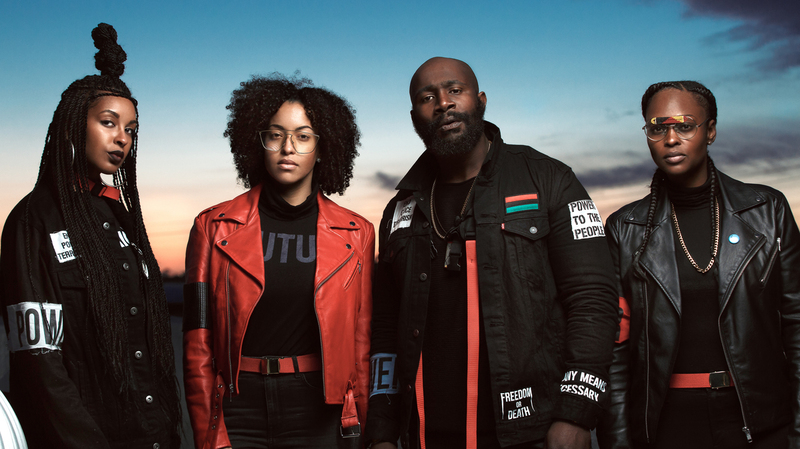 The group's name, which is an acronym for Source of Light, represents a teaching tool the artists use that allows students to transcend everyday strains of being black in America. "It's this position where I no longer could withhold the observation of living the black experience and I no longer could hold the narrative," Bailey explains. "But I knew there was light in it, I knew there was power in it." The group's debut album, The SOL of Black Folk, is out now and SOL Development members Karega Bailey and Felicia Gangloff-Bailey joined NPR's Michel Martin from KQED in San Francisco to discuss balancing teaching with music-making, relating their art to their lives — the group wrote the song "Brother" after Bailey's brother was shot and killed in 2014 — and more. Listen to their conversation at the audio link and read on for interview highlights. Felicia: It's funny because I never expected this to go this way, with the music. I mean, it's really kind of taken over, but it's been the most effective vehicle in touching students and directly touching their heart. I've been fortunate, and I think it's absolutely necessary considering the content that we are creating, that you stay heavily immersed and grounded in the roots of what you're speaking about. Karega: Teaching is the practice. We're practitioners of education and the learning spectrum. Think of the music as a report, think of music as report writing. You gotta understand, I'm born in roots and culture reggae. I'm a child of hip-hop, and these have always been ethnographic tools to be able to report the conditions in which we're living in, right? — said Nina Simone. So, my lived experiences in the classroom were worthy of stories and reports being told. The music literally was my way to exist and survive. They're so harsh, right? But their metrics of music, they hold it similar to a lot of the other music they they digest. They want to know, are we famous and are you doing this yet? But they love the fact that their teachers are touching the world, and creating music that they get to come home and look up on YouTube and share with their family and say "look what my teacher made." Felicia: Those are my favorites when they come, "I saw you on YouTube" and "I saw you here." And then it's an incredible experience to be performing on stages and then they show up. Karega: At the truest core of the lyric writing, it was my offering to let my students know they're seen. Because when you work in a school system, they can think that you are subject to the system and the way the system treats them. But I want to show them that we see them, that 'I see you.' So the earliest songwriting was actually very much dedicated to honoring their stories, honoring their lives and unpacking that, and that's what gave us the glue in the classroom. My classroom became significant to them once they realized that their stories mattered in the classroom. Karega: Our suffering is connected. Our suffering is so connected and so is our love. And having the opportunity to choose love and choose a path of freedom, paid for by love and liberation ... This idea is, if I have a path to freedom, if I have an inception, an idea of better circumstances, I have to love you enough to make sure that you're included and not excluded. It's the exclusion that creates the crime, the harm. It's the feeling unseen or unknown and needs unmet. So really, [I'm] opening this up to say, our love is connected and so is our pain. At some level, I have to understand that I was connected to the person that took my brother's life.